The Laws of Passover: The month of Nissan, Laws of searching, destroying and purging chametz. The code of Jewish Law of Rabbi Schneur Zalman of Liadi. The Shulchan Aruch concerns itself with the here and now of daily existence. Indeed, it seems that no detail of mundane life is left unexamined and undisciplined by the law, of halacha, of Torah. 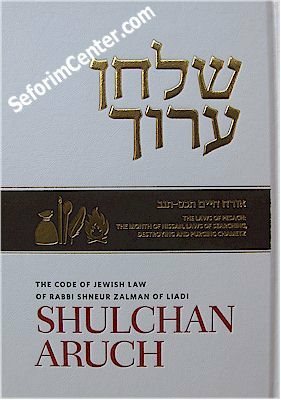 With profound joy we now present the new edition of an English translation of Rabbi Schneur Zalman's second magnum opus, Shulchan Aruch HaRav, the Code of Jewish Law.